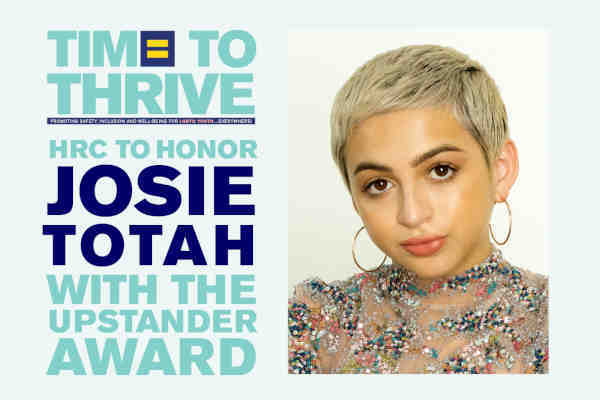 The Human Rights Campaign (HRC) Foundation this week announced that it will honor actress and LGBT advocate Josie Totah at its sixth annual Time to THRIVE Conference. HRC will present Totah, 17, with its Upstander Award during its February 15-17 conference in Anaheim, California. Totah, who starred in the NBC sitcom Champions, came out transgender in a power essay last year. HRC previously announced that it would also be honoring television personality Earvin “EJ” Johnson, Olympian Adam Rippon, Judy and Dennis Shepard, the parents of Matthew Shepard, and Brian Coleman, the American School Counselor Association's 2019 “School Counselor of the Year,” at its annual conference.